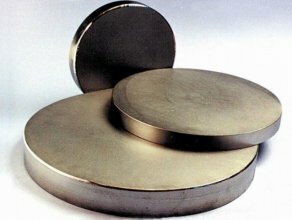 Due to the high specific strength and exceptional performance, titanium alloys are widely used in transport engineering, heat power engineering, chemical and processing industry, where the production process involves high loads I. aggressive environments. Advantages of titanium alloys is hard to overestimate. Today they occupy a leading position in the ranking of the most relevant materials. Many spheres of industry, owing to such alloys of a new generation were able to improve production processes and to ensure long term reliable operation of the whole complex of equipment. This metal is not terrible temperature changes, fatigue loads, vibration, it is biologically inert, in addition, it is non-magnetic material. This titanium technical purity — easy heat-resistant metal grey tone with t° melting 1668 °C. provides satisfactory coefficient of thermal expansion, low density (4.5 g/cm3), plasticity allows you to stamp items of any shape. The surface oxide film makes titanium corrosion and chemical resistance equal to the noble metals. In sea water the rate of corrosion does not exceed 0.002 mm/year. Low plasticity under pressure treatment. UD. the weight of 4.41. Low plasticity and medium toughness. t° melting point of 1000 °C. Al improves the heat resistance and strength, but reduces the manufacturability. It is easily welded. Excellent castability. Fragments of continuously operating at a temperature of 350−400°. High chemical and cryogenic resistance, plasticity, good weldability, insensitivity to cuts, significant fatigue strength, allows you to use semi-BT series in cryogenic equipment, shipbuilding, machine building, rocket production, aviation, processing industry etc. Our website offers a wide range of titanium semi-finished products. High quality of products and lack of intermediaries determine the most favorable conditions for their acquisition for solving current production problems. Delivery in the shortest possible time in any region of the country and abroad, compliance with regulatory documentation already gained the trust of regular customers. Due to the relatively low cost and wide model range, titanium semis are always popular in all areas of production.